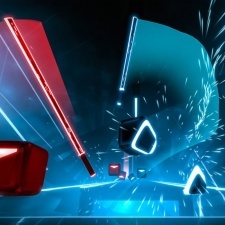 Beat Saber players are flicking faster than Valve thought “humanly possible"
Valve has been forced to push an update to SteamVR after players were found to be flicking their arms at inhuman speeds. Beat Saber is a rhythm game that sees players pop on a VR headset and use their motion controllers to slash moving blocks with laser swords to music. In faster, Zen-like moments, some players were moving their wrists fast enough to flag warnings on SteamVR’s tracking system. When designing the tracking system, Valve made a number of assumptions based on how the hardware would be used - some of which were determined based on the presumed limitations of the human body. “The tracking system has internal sanity checks to identify when things go wrong,” said Valve developer Ben Jackson, speaking to RoadtoVR. “For example, if our math says you are behind your only base station, clearly we made a mistake because we wouldn’t be getting any signal from behind the base station. Beat Saber players should now be free to whip their wrists at speeds thought beyond human possibility, without fear of SteamVR lagging behind.